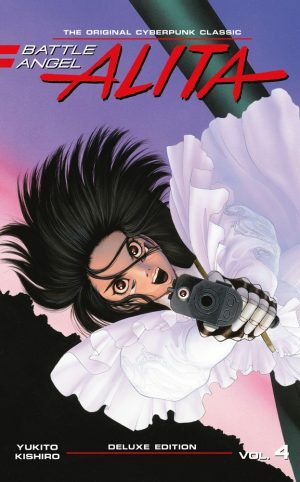 Battle Angel Alita is a series that grows in scope and ambition, and Yukito Kishiro an artist who progresses phenomenally from the first half dozen chapters. They begin well with charm about the characters, and detail, but Kishiro had little idea about how to lay out a page, and substituted storytelling with kinetic energy. 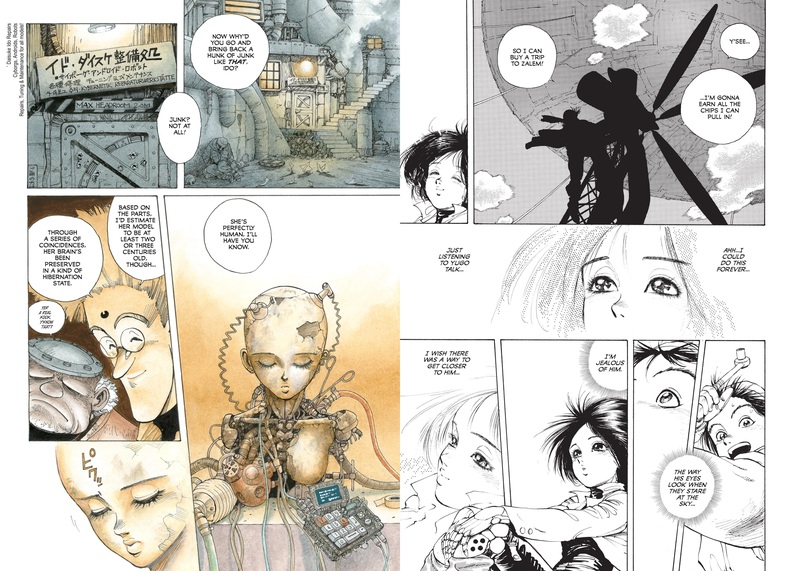 Beyond the idea of engineer Daisuke Ido finding Alita’s torso and reconstructing her, there’s only hints about those first half dozen chapters indicating the series would become something special. Alita fights a mutating cyborg, and that’s imaginative, but it’s so extended and so confusingly drawn that you have to be really absorbed to notice anything other than enthusiasm. That makes the second half of the book all the more surprising. Kishiro has taken a step back, begun to consider how to make sense of what were previously random background details of a post-apocalyptic world, and completely re-focussed his story. Instead of manic cyborg on cyborg action we have a tragic love story. 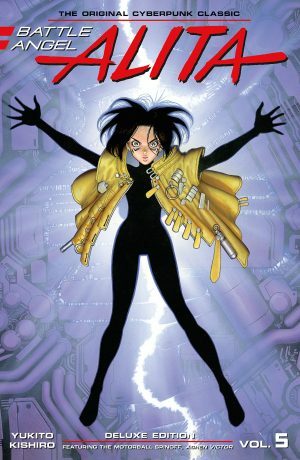 There’s still enough action, but what holds everything together is Alita’s passion for Yugo, who in turn has his own passion, an overwhelming desire to pull himself away from the Scrapyard and reach the tethered floating city of Zalem where the privileged live. It’s a puzzling shift of emphasis until placed in the context of the series as a whole, where Kishiro constantly switches between genres. Most of volume two in these new editions is a futuristic sports story. 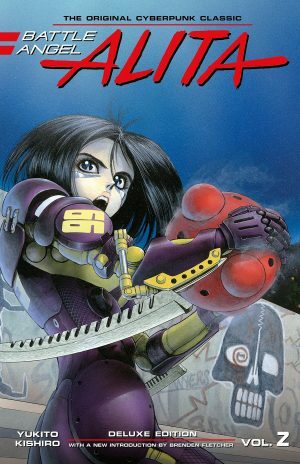 Battle Angel Alita was enormously influential and is fondly recalled, yet it took the announcement of a live action film to prompt new English language editions of the long out of print classics. The stories are what originally occupied the first two paperbacks, Volume one (also known as Rusty Angel) and Tears of an Angel, and in most ways the five volume set issued beginning in 2017 is an improvement on the earlier versions. They’re very nicely produced hardbound editions, and at standard US trade size, so presenting the art at approximately the size it was originally printed in Japan during the 1990s. The original American editions were published in an era before English language audiences had become used to reading Japanese-originated comics from back to front. These books do read that way, so don’t need to flip the art, and colour is also restored to the sections opening each chapter, meaning these editions are faithful to the way Yukito Kishiro intended his work to look. That’s all good. 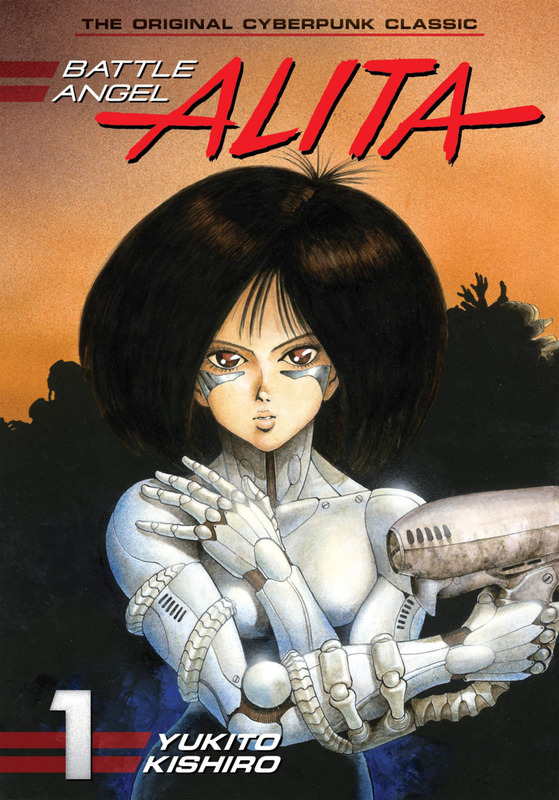 Anyone coming to these editions fresh won’t be bothered, but if renewing your acquaintance with Alita you’ll find sound effects remain in Japanese, and names formerly changed to sound more English are now different. The floating city is now Zalem instead of Tiphares, and Hugo is now Yugo. Not so good is ending the collection before the second story is complete, which only would have required an additional twenty or so pages. Far worse, however, is that Kodansha have scrapped the 1990s translation. It could be the new translation is more faithful to the original Japanese, but time and again it includes awkward phrasing, at its worst really jarring and killing the mood. It outweighs so much of the good to the point where it has to be mentioned. Alternatively all five hardcover reissues are combined in one slipcover set along with a sixth book of other material.